Oops, I meant to post this yesterday, but time got away from me. I had a busy day yesterday of working on a glittery Tommy Gun prop for a upcoming League of Space Pirates show. Then, I met an old friend from college for dinner. Wish we could have hung out longer, but the snow started coming down. The snow was sticking to the roads about half was through the drive home...an hour drive! By the time I got back home safely, my anxiety and paranoia was in full effect...which made me barely function. I'm still a little tense this morning. But, I digress, that is not what this post is about... 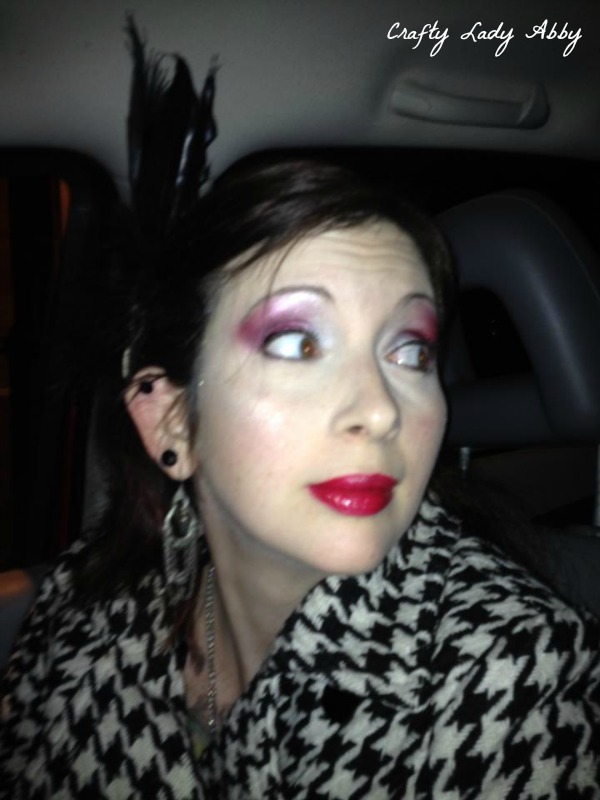 It's about the makeup I wore to the Emile Autumn and The Bloody Crumpets concert on Wednesday. I took one photo and my husband took the other with our personal phones. We were waiting in the car for the bars to open, so we could get a few drinks and some cheese fries before going to the show at a performance venue close by. My husband's photo is closer to what the makeup looked like, though still a bit muted. My photo made the colors washed out...and sort of purple. Hey, but my skin looks flawless! I know all you are really interested in is what makeup I have on, so let's get to that. Dramatically Different Moisturizing Lotion by Clinique - All over my face and neck, except my lips. Natural Finish Cream Concealer in Light by Shisedo - Under my eyes, the eye space between the lid and brows, and all over my nose. I used a concealer brush to apply and blend it, which is a 1st for me. Works MUCH better than my fingers! Blended Face Powder in Transparency Neutral by Clinique - All over my face and neck, except my lips and eyelids. Mineral Bronzer in Golden Bronze by Revlon ColorStay - This is the 1st bronzer I've found that is light enough for my pale skin. I bought it at 5 Below. It doesn't appear to be still manufacturer. Thankfully, I don't wear bronzer often. Roll On Eye Shimmer in Platinum by NYX - A sparkly highlight heavily across my cheek bones and temples. Lightly on my forehead and nose. Eyeshadow Primer Potion in Original by Urban Decay - All over my eyelids, up to my brows. Jumbo Eye Pencils in Rust (Dark Red) and Pots & Pans (Silver) by NYX - I used these as a base to make the related eye shadows pop better and last longer. I applied them directly on, but used a brush to smooth them out and blend them where they met and up towards my brow bone. Here's where it get a bit wacky. I used a variety of eyeshadows. I'll start with the ones that I used the most of, then the others when I was trying to achieve some depth in the red. Pressed Eyeshadow in Silver by Jane - Not manufactured any more. Glam'Eyes Professional Liquid Liners in Black Glamour by Rimmel London - I love this black eyeliner. It doesn't flake and stays on well for hours. It's even hard to remove with soap and water. Lip Flash Full Coverage Pencil in Hot Flash by Milani - I love how smooth, opaque and shimmery this chubby lip pencil is. I find it easier to apply than regular lipstick. It lasts a long time and feels great on. I know, that's a lot of products, but it's mostly the eyeshadows that are the most extensive. I wanted to play around with the new red eyeshadows with the Sugarpill Love+ that I've had for a while. 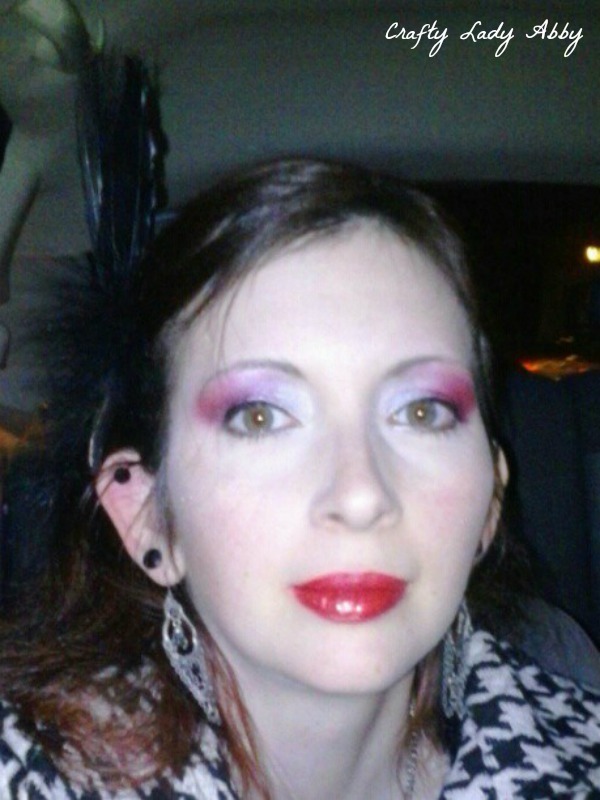 Hopefully, it looked better in person, as red is an unusual shade to wear for eyeshadow. The only downside of wearing red eyeshadow, is that it stained my skin. Is there a solution for preventing that when wearing red eyeshadow? I had concealer there to help prevent that and even out my eyelid color...though of course eyeshadow distorts that. You get my point...maybe. Anyway, this was a fun makeup look to do. Something I'll definitely play around with again.